AEON MALL Kyoto is located close to Kyoto Station’s Hachijoguchi exit. The shopping mall, which is one of the biggest malls in Kyoto, consists of two buildings, the 7-story Sakura Building and the 6-story Kaede building, and at the mall you can find all kinds of things, like daily necessities, foodstuff, clothes, “zakka (small things useful in everyday life),” restaurants, movie theaters, and even a game center. There are around 130 stores inside the mall, including such fashion brands as UNIQLO, GAP, and Forever21, and such household goods brands as Muji and Daiso, which are also very famous overseas. On the restaurant floor, you can enjoy a wide variety of dishes, from fast food by McDonalds and KFC to such Japanese classics as conveyor belt sushi and shabu shabu. At this shopping mall you can find almost everything, so if you notice you forgot to take something with you, you can rest assured you can get it at AEON MALL Kyoto. This place can also be recommended to everyone into Japanese games, anime, and music, as you can find a game center, movie theater, and shops catering to these needs at the mall. On the second and third floors of Sakura Building, you can find such clothing and zakka stores as UNIQLO and Muji. The second floor is for women’s clothing while the third floor is geared for families, and at this mall, you can even find some Japanese “select shops,” which carefully hand select a good selection of brands for you to choose from. Some of the stores offer tax-free shopping, so remember to take your passport with you. What makes Kaede different from Sakura Building is that there are only two or three specialty shops on one floor. On the fourth floor you can find the 100-yen shop Daiso, on the third floor you’ll find a sports shop, on the second floor a book store, and on the first floor you’ll find Toys R Us. You can access Sakura Building from Kaede Buildings second and third floors using the Miyako Bridge passage. The restaurants on the fourth floor offer seating to a maximum of 650 people, and there are many different ones, like Japanese restaurants, sushi places, and fast food restaurants, but the floor also contains the biggest food court around Kyoto Station. There is also a game center where you can enjoy the latest VR-games. There are also subculture merchandise stores selling items that are popular among young Japanese people, so this floor is a lot of fun. 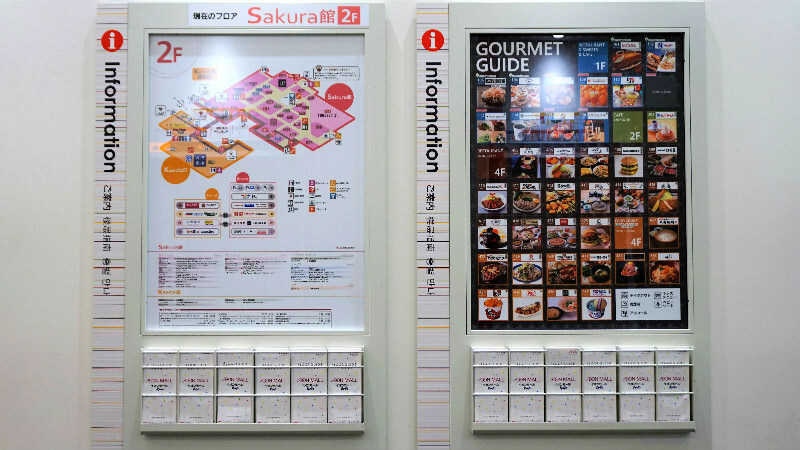 On the first floor of the Sakura Building, you can find a big supermarket where you can get all kinds of food items. The supermarket is open until 10 p.m. at night, so if you are going to cook in Kyoto, this supermarket is very convenient. Plus you can also buy edible souvenirs here! Although the mall is very big, they have floor maps on each floor in English, Chinese (both simplified and traditional), and Korean, so you don’t need to worry about getting lost. Tax-free and overseas shipping services differ from store to store, so please ask the staff before buying if you need these services. This mall is close to Kyoto Station and very spacious so it’s easy to spend the whole day here. My Taiwanese friend especially like that there is a supermarket and a UNIQLO store inside the mall. Many stores and restaurants in Kyoto close early, so I recommend buying some snacks and food to go here to take back to your hotel. You can find all kinds of shops and restaurants at AEON Mall Kyoto, like clothing shops and interior goods stores. It’s located right in front of Kyoto Station, so access to it is perfect, and if you need to buy something when traveling in Kyoto, you just need to come here. There is bound to be something that matches your needs here! A 5-minute walk from Kyoto Station’s Hachijoguchi exit. They have free Wi-Fi, ATMs, and some of the shops have tax-free and English-speaking staff, making this a very convenient shopping mall. Possible at some of the stores.